This project is supported and funded by Jersey Heritage. This project is designed to last for two years. To hand build a Neolithic style longhouse using available evidence. To train the volunteer team in the practical methods and techniques of traditional construction. To create a finished building that will be populated by knowledgeable and skillful volunteers and become an education and living history venue. To enhance the passage grave at Hougue Bie with a view of Neolithic life. To employ authentic techniques at key stages of the build. To increase visitor numbers to the site. Jersey is rich in the tangible remains of the Neolithic period. La Hougue Bie is a fantastic example of a Neolithic passage grave, and it’s remarkable preservation, along with many other monuments on the Island, testify to the presence of significant farming populations during the Neolithic period. One issue we face when looking at the visible landscape of the Neolithic is the presence of large stone build monuments and a dearth of visible houses or farms. Classic sites such as Skara Brae in Orkney, are rare examples of surviving dwellings and represent the use of stone as the main structural component of their construction. The majority of Neolithic dwellings were constructed using mainly organic materials and as such leave little trace behind for archaeologists to find. What the evidence clearly shows is a longhouse tradition of architecture that sees its roots in the central and eastern countries of Europe and that spreads ever westwards until it reaches the shores of Brittany. This project focuses on the construction of a building that pre-dates surviving vernacular architecture in Europe. As with any three dimensional reconstruction of archaeological evidence there is a fine line between “making it up” and underplaying the abilities of our ancestors. We should be acutely aware that even the best reconstruction – using the best available evidence, will only ever give an impression of how things might have been and is inevitably limited by the lack of available evidence. It is worth say here, that evidence provides us with a minimum level of technological sophistication in the past. The odds of the very highest achievements in timber working surviving the ravages of time are remote indeed. It is a fact that almost every archaeological discovery increases our estimation of past abilities. The closest Neolithic building tradition to the site of La Hougue Bie comes from the Armorican cultural complex of Brittany. Although few examples of Neolithic houses are currently known, recent discoveries from Kervouric tie in with other Neolithic evidence from this period and indicate a longhouse tradition based on isles of three posts. The Passage grave of La Hougue Bie is dated to around 3500 BC and ties in well with this building style. The similarities between the stone built funerary monuments and surviving evidence for timber built houses has been well documented over the years, and whether a stylistic coincidence or an attempt to mimic houses for the living and dead is not the concern of this project. What seems clear is the importance of structures that are both long and proportionately narrow. The orientation of longhouses seems to concur with long barrows and passage graves that are orientated from NW to SE or W to East. The Entrance is associated with accumulations of finds that occur at the SE end of the structure. There is a suggestion that some “Y” shaped post hole configurations at the mid-point of some longhouse footprints may indicate an entrance way on the NE facing long side (evidence for actual entrances here is scanty – it is also on the darkest side of the building – although sheltered from prevailing winds). Suggestion has been made that the “Y” configuration provides lateral stability from winds, but this seems unlikely as stability can be achieved simply without changing the fundamental framework of the building by the addition of triangulated supports in the main trusses and rafters. Having thought in detail about this “Y” shaped post configuration, I am inclined to assume a functional rationale that focuses on the central bay (of the three bay houses) as the primary location of living and cooking. The decrease in posts within this area allows for more living space while the “Y” post pattern may be structural supports for a leeward smoke vent in the roof. If this is the case, the finished roof would have something akin to a smoke “dormer” window which would draw smoke out of the building with a typical SW prevailing wind. Further questions arise from the ground evidence of buildings from this period. The close proximity of two post lines towards the NW third of the building seems to be repeated elsewhere in other buildings and may point to a gallery that cuts across the building with a suggested doorway at both ends. This would allow direct access to the third bay without disruption to bays 1 and 2. Why this might be necessary may be informed by the very different construction techniques exhibited in the walls of bay 3. Unlike the rest of the house, the evidence for walls in bay 3 consists of slot trenches and not individual post holes. The use of slot trenches as foundations is known from other Neolithic house plans in Europe but not usually in conjunction with other building styles as seen here. A slot trench indicates the placing of large longtitudinal timbers as foundations in this bay – which, in turn, suggests the jointing of further timbers above. This type of wall might indicate a timber foundation or “Sill Beam” which is morticed to take vertical planks or posts. The sill beam allows for the close spacing (butted) placement of split or whole logs to create a very sturdy wall, which , in turn could be finished with another longtitudinal timber at the wall top (“Wall Plate”). 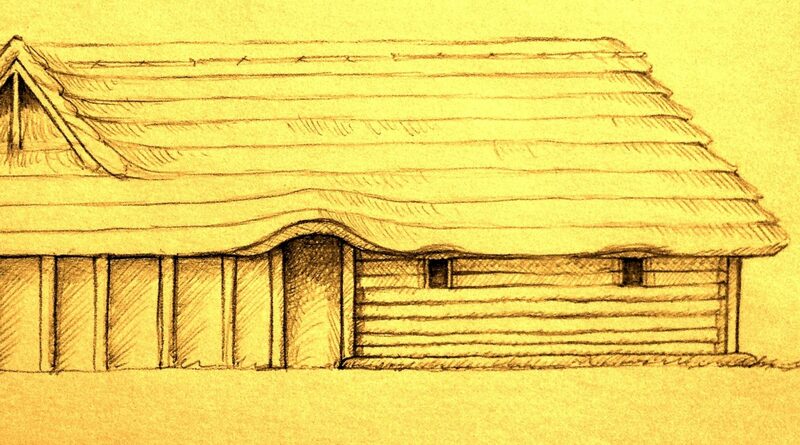 A second interpretation of the same evidence may see the sill beam construction as the start of a longtitudinal timber wall – in essence, a log cabin, with successive timbers placed above the previous until wall height is reached. Both methods require simple but high quality carpentry to ensure a structurally sound wall. The reasons for the slot trench in bay 3 – and the suggested wall interpretations above are as yet undiscovered. From a purely functional standpoint, a heavy timber wall provides a strong place that is well insulated and difficult to gain access to or from. It may be that this third bay represents a byre area for large or valuable domesticates such as cows and sheep. The presence of an embedded sill beam might suggest the attempted prevention of digging by pigs. Another suggestion is the prevention of rodents to this bay, possibly inferring the use of this space as a store or granary. The obvious difference in the construction of bay 3 also supports the possibility of a gallery which allows access from both sides of the building and shuts it off from the supposed main living space of bay 2. This would appear to anticipate the much later design of Viking and Medieval halls which also incorporated byres and included separate access solutions. Whatever the reason, this part of the building would have a very different feel to the rest and be visibly more robust and serious in its construction. The structural frame of the building is interesting because of its direct affect on the usable space inside. The employment of 3 isles of posts throughout the length of the building suggests a lack of knowledge or use of tie beams. A tie beam allows high structural timbers to be supported indirectly and increases the usable space in a building by removing supporting posts from ground level and placing them on spanning tie beams above. The fact that this type of building exhibits posts that seem to directly support the roof ridge line infers a lack of tie beams which, in turn suggests the employment of simple carpentry joints or lashings rather than multi directional joints that are capable of meeting several timber elements in one location. It may be that specific compromises have to be made according to visitor access and numbers, but it is my hope to create a building that will be able to enlighten the visiting public while enabling insight to this type of architecture and Neolithic life to be made. This building style pre-dates known timber framing methods by at least 2500 years. The precise carpentry joints and plank processing techniques employed in the Roman and Medieval periods are sometimes impossible given the lack of saws and other available tool types in the Neolithic Period. However, recent evidence from Germany has astonished archaeologists and elevated our appreciation of what was possible in Neolithic carpentry and thus building techniques. A project such as this (working with large timbers rather than coppiced materials) enables us to look in detail at this latest carpentry evidence and to employ it in the proposed longhouse. The timber frame is based on three isles of vertical earthbound posts which take at least two thirds of the roof weight as a vertical loading. All earthbound posts must be well set in the ground to provide the necessary cantilevering to prevent lateral movement. The centre isle of posts supports the timber ridge beam elements (jointed in several sections), while the two remaining posts isles run parallel to this line on either side and support two jointed purlin beams. These purlins support the mid-point of the rafters above and transfer the roof load vertically to the ground. The final load bearing elements of the frame are the wall posts which are cantilevered in the ground. The relative accuracy in wall post–hole alignment allows for two interpretations of their use. They could directly support the rafter ends with simple cup joints and lashings and themselves be stabilised by weaving them together with pliable materials, or a carpentered timber could run their length (jointed into each post top) to create a rigid wall plate. This would allow the rafters to be positioned at any suitable and regular interval along the wall plate’s length. This decision awaits the identification of suitable construction materials for the project. The pole rafters run from the ridge beam to the walls and are supported by the ridge beam, purlins and wall plates. The thatch is supported by secondary purlins of smaller proportions that run horizontally across the rafters at 500mm vertical intervals (forming a ladder up the roof). Thatch is then clamped between these secondary purlins and additional sways and held in place with lashings. The frame design is simple and does not exhibit many of the later complications of the Roman and Medieval periods. All long timbers are jointed with plain scarf joints, bound with lashings and supported atop vertical posts using a cup and tenon joint to prevent lateral movement. Diagonal bracing can be simply installed to prevent longitudinal movement in the building. This can be achieved by lashing poles diagonally across the rafters from purlin to wall plate height.